Once the plugin is installed and enabled, you will need to go through and save your desired setup. To do this, you need to go to your BuddyPress Settings page in your wp-admin area. Here you will find a new “Leaderboard” tab which will take you to the plugins settings page. There is two ways the plugin can operate. 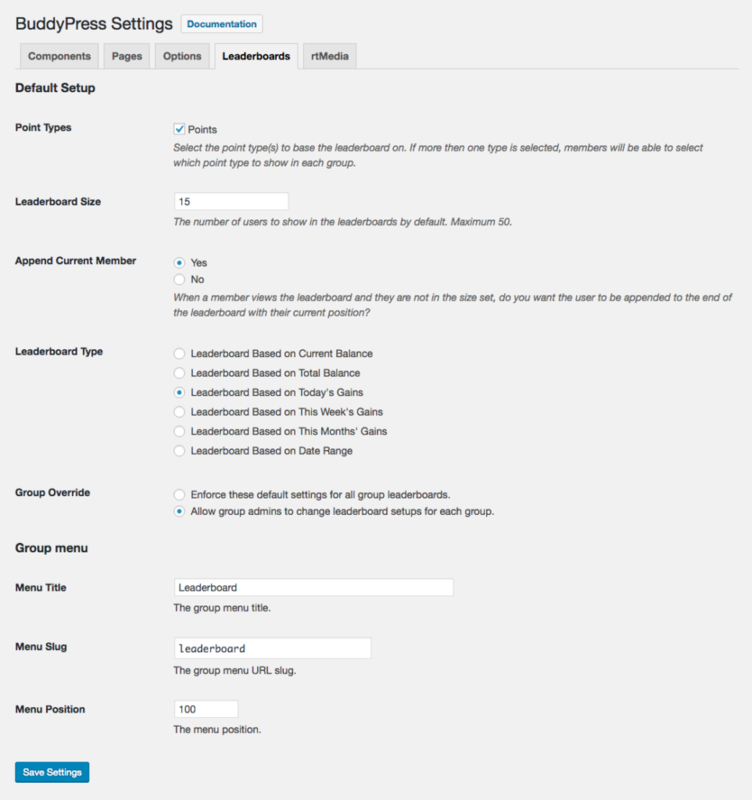 You can either enforce one setup on all groups or let your BuddyPress Group admins setup leaderboards themselves. In either case, you are required to set a default setup. This includes what point type or types to create leaderboards for, the size of the leaderboard, the option to append the current user and the leaderboard type (as of version 1.1). The size of the leaderboard refers to the number of users to include in the leaderboard. The larger the size, the more resources will be required in order to query the leaderboard. For this reason, the plugin, by default has a limit of maximum 50 users being shown in a leaderboard. You can change this using the MYCRED_BP_GROUP_LEAD_MAX_SIZE constant. If the user viewing the leaderboard is not in the size you set, you can select to append them to the end with their position. This will only be applicable to those who are a member of the group, are logged in and are not excluded from the point type the leaderboard is based on. Once you have selected the leaderboard type, you need to decide if these settings should be applicable to all groups or if you want to let admins create their own setups. If admins are allowed to setup their own leaderboards, they will be able to do this in their Groups admin area in BuddyPress. Finally we need to setup the BuddyPress navigation. This includes the title shown in the menu, the URL slug for the leaderboard page and the menu position. The URL slug must be unique to prevent conflicts with other BuddyPress group pages!